Service to others is a deeply held tenet at Prairie and part of learning is learning to give back. This spring, students and teachers participated in a range of activities including water testing nearby streams for water quality, group cleanups at sites throughout Southeastern Wisconsin, and an Upper School dance that raised over $5,000. These activities were components of this year’s “Emily’s Day” at Prairie School. Following high school student Emily Maki’s passing in 2011, the school decided to dedicate on-going Science and Earth Day activities to Emily’s memory. On the evening of Friday, April 12, close to 100% of Prairie’s Upper School attended a Dance-a-thon organized by the student government. The evening began with a few informal Zumba, Swing and Irish dance lessons. Students, teachers and visiting French students danced the the remainder of the evening while raising over $4,000 through sponsors, bake sales and food sales. All proceeds were donated directly to the Juvenile Diabetes Foundation in Emily’s honor. A week later, The Primary School embarked upon their own set of activities. “This day was so much fun. This was the best day ever,” exclaimed a Prairie School kindergarten student, following a hands-on soapy science station in the school gym. Minutes before six-year-olds swirled rainbows of bubbles that defied gravity, learning how scientists study soap bubbles to understand our universe. 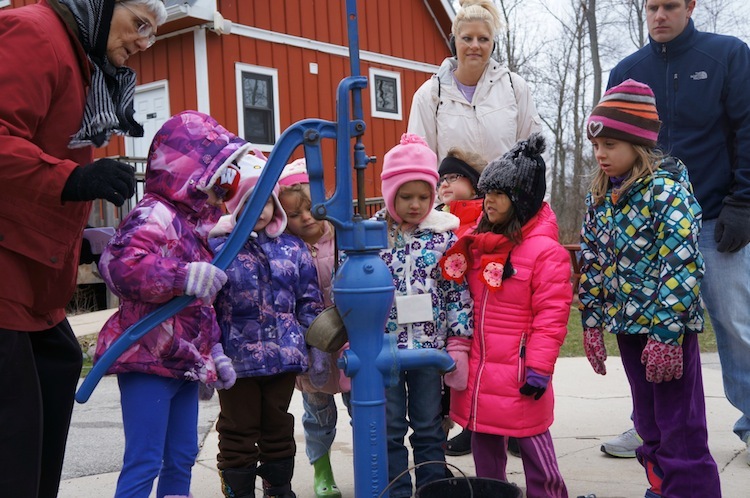 Prairie’s youngest students also traveled to the Riverbend Nature Center and Eco Justice Center where they participated in outdoor activities. Students learned about the water cycle, photosynthesis, food chains, and animals and their habitats. The third graders also conducted stream testing at Shoop Park as part of their ongoing analysis. Finally, on Earth Day (April 22), upper school students boarded buses that dropped them off at over a dozen locations throughout Racine. Students volunteered and worked with multiple locations including the Caledonia Conservancy, Eco Justice Center, Riverbend, Cliffside, HALO, Racine Co Food Bank, ReStore, Racine Zoo, St. Monica’s, Petrified Springs, and more. Late that afternoon, students returned to campus and assembled into the John Mitchell theatre where the Maki Family would share a few memories and appreciation for the school’s ongoing support. To honor Emily through a day of service aligned perfectly with their daughters character and beliefs. 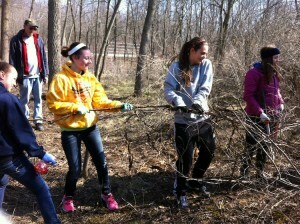 Service Learning is an integral component of Prairie’s curriculum. Through events like Emily’s Day, students learn responsibility, leadership, critical thinking, and problem solving. Students truly to walk away with an appreciation and awareness of their ability to make a positive difference. Great job everyone! This entry was posted in All News, Featured, Primary School, Sustainability, Upper School, Volunteer & Event by Communications Department. Bookmark the permalink.